At the Manchanda Law Office PLLC, we take great pride in the extremely high levels of competence, integrity, creativity, speed, thoroughness, and accuracy of our work. The vast majority of our Clients are people with very complicated and difficult matters who have been dissatisfied with their previous Attorneys. We at the Manchanda Law Office PLLC make it a top priority to promptly return our Client’s calls, constantly stay in communication with our Clients, deliver a neat, well researched and strong Attorney work product, aggressively and zealously fight for the rights of our Clients, and above all, never take no for an answer. It is for all of these reasons that we enjoy great success and a solid reputation and referrals from our Clients who know that when we are retained, we will do every thing within our power to make good things happen for our Clients. This is our promise. "I received the Permanent Resident Card in the mail yesterday. I was so excited to have the real thing in my hand. It's been exactly 5 months and a week for my case approval -once again thank you and your staff for the kind, compassionate, loyal, and dexterous work you have put into my case. On behalf of my wife, mother-in-law I would like to sincerely thank you and your staff...for now I am going to make good and celebrate the success of our story...First of all I would like to thank Attorney Rahul Manchanda and everyone at the Manchanda Law Office PLLC for putting in a great effort towards my case and helping me get results so quickly...On April, Friday the 13th, we made a desperate call to the Manchanda Law Office PLLC. To our amazement there was an immediate call back from Mr. Rahul Manchanda himself. I had overstayed my B1 Visa for 3 years, Mr. Manchanda at once advised us on situations that would help our case. On 13th April 2007, we signed a contract that made the Manchanda Law Office PLLC our official attorney. They guided, counseled, and acted promptly. All the paper work for my Adjustment of Status, I-765, I-130 and I-131 were filed concurrently on May 24th 2007. With such wonderful Attorneys and Paralegals filing our case, we were shocked to receive my Biometrics appointment within 10 days of filing our case. More shocking to us was when we received our I-485 Interview letter just after a month and a half. Without the experience and expertise of The Manchanda Law Office PLLC team, I don't think we could have achieved SO MUCH in such LITTLE TIME. To us the Manchanda Law Office PLLC is the best Immigration Law Firm in the United States, with the best Attorneys and Paralegals on hand for the worst situation. We recommend the Manchanda Law Office PLLC to all of you with immigration situations that seem to be doomed...Thank you for taking my case and helping me live life in a happier environment...I would like to thank you sincerely from the bottom of my heart for the great effort and help towards helping me. You and your staff have been efficient in providing successful results at a mighty quick pace...I cannot explain in words how happy we all have been since the approval but all we have in simple language is to say a "Big Thank You" to you and your team for the wonderful work you all put into my case. Once again on behalf of my mom-in-law and my wife, Chelsey, I thank you sincerely for the quick, steadfast, honest, and hard work put into my case, resulting in success. With Great Regards and God Bless." "My experience at the Manchanda Law Office PLLC has changed my life in a positive way. My case was extremely complicated and no other Attorney would take it - taking is a different story, they wouldn’t even talk about it. One day a friend of mine referred me to the Manchanda Law Office PLLC and I called up with hope and spoke to Mr. Manchanda. While I was talking to him I figured that this was the right Attorney for me he because he was so aggressive, concerned, supportive, and enthusiastic towards me as a Client. Not only Mr. Manchanda, but also all of the members of his firm...All of the members of the Firm take Client problems like it’s their own; I wish all of the Attorneys of the world can discover the magic of gaining customer satisfaction from the Manchanda Law Office PLLC.Thanks." "Mr. Manchanda has extraordinary knowledge in the field of Immigration Law and the Lawyers working with him are also very brilliant. With regards to my case I have had bad experiences with other Lawyers. I had a complicated case, but Mr. Manchanda and his legal team solved it. My Petition has been approved and I would like to do a special thanks to Manchanda Law Office PLLC who really devoted a lot of time to getting my Petition approved." "The Manchanda Law Office PLLC came highly recommended to us. We were told that they would be able to help us where others were unable to. That turned out to be exactly the case. Our case was very complicated and no other law firm was able to give us any hope of success. Manchanda Law Office PLLC was able to review our case from a standpoint NEVER thought of by others and have pursued our case aggressively and vigorously. I can recommend them unequivocally and without hesitation." "Manchanda Law Office PLLC is by far the Best of the Rest. The Staff there are incredible...Words cannot explain how wonderful Manchanda Law Office PLLC is to their Clients. My brother's case was very difficult because of a prior Deportation Order, and we went to 10 different Attorneys, who refused to take on his case. But the Manchanda Law Office PLLC didn't refuse us. Not only did they take on his case, but now my brother is out of prison. What was once the impossible, becomes possible, in a matter of months. Words cannot explain the way these people work and care for their clients! They make you feel so comfortable at every step of the way - it's amazing. Because of my personal experience with this Firm, I would be very happy to give a reference to anyone..Thank You!" "Rahul, I appreciate your work on my case. Thankful for the very well prepared drafts...Also thanks for suggesting me in some good directions. Thanks." "The Manchanda Law Office PLLC has proven to be a very aggressive, knowledgeable, and compassionate law firm. My case is very complicated and other Attorneys could not help me reach a positive outcome. I am very grateful to have the dedicated Manchanda Law Office PLLC representing me." "I am a victim of spousal abuse. I've been denied help several times because of my immigration status of being undocumented in America and also for being married to "just" a legal resident; the reason being, for me to receive help, my husband had to be a U.S. Citizen, and this made my case very complicated. I've pleaded with many Lawyers for help, many saw my case as a dead end; One actually laughed when I asked if I was eligible for a U visa, but thanks to the aggressive, knowledgeable, compassionate and dedicated Manchanda Law Office PLLC I can finally see hope, and an end to my despair...Mr. Manchanda, I think you are a man of your word, and someone that cares deeply for his clients." "Since I have been dealing with the Manchanda Law Office PLLC, I feel very good that my case is being followed up on each day. I am getting weekly updates of letters, and of your contacts, and I’m being included in possible strategy which I feel is good...You have shown great determination to help me with this matter and you have always been sincerely professional and always helpful. (This is not usually the view you get of law firms)...Every call that I receive from your firm is a sign of hope...And for that I am grateful to you for your continued efforts. You have been nothing but helpful. Thank you once again for all you are doing." "First of all thank you so much for winning my Federal Mandamus Litigation Case. I was really stuck with my Citizenship Case and thanks to you, I got my request, and that made me really happy. I really appreciate your help. I have been waiting for almost 3 years since I passed my interview to get my Naturalization Oath based on the work of another attorney. Finally I got my Naturalization Oath Ceremony because of your help and support. Now I can sponsor my wife as soon as possible. This is one of the best pieces of news I have ever received in a really long time. Once again: thank you so much for making my life easier." "I just wanted to take the time to thank you and the exceptional legal team at Manchanda Law Office PLLC for the more than positive result in the case today. Due to your expertise, fast handling and experience, Manchanda Law Office PLLC has enabled us to keep our family intact in the U.S. and eliminate future immigration woes relative to my husband's new Adjustment Status Filing due to this criminal defense/immigration matter. It was a special weekend to celebrate our son's 3rd birthday together with the knowledge that things were going to work out. We are very, very grateful...Again, thank you for a job well done, especially in such a short time frame." "We filed a Federal Court Mandamus Action with Manchanda Law Office PLLC and within months I had my permanent residency status after waiting six years for it on my own. The Manchanda Law Office PLLC was nothing short of professional. The staff was very dedicated. Mr. Manchanda himself was personally involved in every aspect of my case. It was a very positive experience for me and I would recommend him to anyone who needs Immigration Counsel." "I would like to thank you for your great advice and help. It's truly a reflection of your firm's professionalism and commitment to your clients. I know I can count on your firm on this case and am glad to be working with you." "I have sought legal services from a number of law offices in the past, but I find that the Manchanda Law Office PLLC is the best. The Manchanda Law Office PLLC Attorneys listen to your case and plan out the best solutions. One`s case is handled professionally, promptly and the outcomes are always favorable to their clients." "I spoke to four different law firms...they never brought up VAWA. I first learned about it from the Manchanda Law Office PLLC and I am so grateful because I don't know what would have happened had I continued with the first lawyer. I never knew there was hope...I was referred by a friend and from the moment I walked into Manchanda Law Office PLLC I knew things would be different. From your wonderful Receptionist and Staff, to the Attorneys explaining how things work. You are young but you know your work, and the good thing is unlike the older people I have dealt with - you went that extra mile and that's the service I was looking for...you made me feel confident that I have a case after explaining everything to me. I have been sleeping better. I am happy I came to you and I look forward to continuing with the Manchanda Law Office PLLC, and hope that I can send many clients to you. It is also OK to have potential clients call me for a reference. Thanks again...many thanks for your hard work...I pray for the best...continuing success to you." "I have been a client of the Manchanda Law Office PLLC since January of 2007...I just wanted to compliment your company for its great work in helping me with my case. I have nothing but good things to say about you...Manchanda Law Office PLLC was very diligent in getting my case approved, and I will be recommending my friends and loved ones to your office. Thank you Mr. Rahul Manchanda." Dear Mr. Manchanda, I’d like to take this opportunity to thank you for a warm and pleasant experience over the past 4 months. As you know, going through a long and arduous ordeal as getting a K-1 visa is no easy task. With the uncertainty of seeing that special someone again, coupled with the emotional feelings associated, makes for a very taxing and stressful time in your life. Finding a law firm such as yours that dedicates their full attention to your concerns, with constant updates and clarifications and key personnel dedicated to your case, makes for a comforting feeling during this time. Manchanda Law Office PLLC in my opinion, has risen to the task, and has serviced our case to a higher level of standard than I am accustomed to. I deal with Attorneys, in land acquisitions, on a daily basis, and only wish I was as satisfied as I am personally with your office. We recently found out that the K-1 visa was approved in only 2 months! This goes to show the dedication of Manchanda Law Office PLLC, as well as the expertise you possess in the field of immigration law...Thanks to you and your staff, we now have replaced our feeling of uncertainty with JOY and HOPE! We wish you continued success!! On behalf of my wife and myself I would like to thank you and the Manchanda Law Office PLLC for all of your hard work. We truly appreciate it...Alla had her interview yesterday and she was approved! We would like to extend to Manchanda Law Office PLLC our deepest gratitude for your support and professionalism during our long waiting period...you always made us strong and positive. Thank you so much!!!!" "I thought I should write this letter to express to Manchanda Law Office PLLC just how much my daughter and your client Nina S. Yalla and I are appreciative of your outstanding services and your sound knowledge of our case. Also, the way you have kept us informed of the proceedings at every step of the way is remarkable, for which we are very grateful. Your professionalism, caring, courteous, and pleasant attitude is very impressive. Our thanks also to the Staff of Mr. Rahul Manchanda who have made our experience with Manchanda Law Office PLLC very pleasant...It is indeed a great pleasure knowing you. My congratulations to Mr. Manchanda for his superb operation." - Sumitra L. Parekh M.D., COL MC US, Director, Directorate for Advanced Pathology Armed Forces Institute of Pathology, Washington D.C.
"My niece had just turn 21 years of age when my sister received her Visa Interview Letter and we saw that her name was not on it. So, I called Manchanda Law Office PLLC in New York to help me with the case...they handled my case with great responsibility. They are very knowledgeable and kept contact with me throughout the entire time. They prepared a Memorandum of Law and sent it to the Mumbai Consulate Office. With that, my niece was able to receive her visa with my sister." "Manchanda Law Office PLLC excels with professionalism, legal competency, and customer service. My case was presented to them under extreme time limits, nevertheless they were able to come up with legal solutions to all of my problems and guide me through that difficult time. I want to highlight the outstanding work of Manchanda Law Office PLLC; not only did they impress me with an immense legal knowledge but also with their abilities to be empathetic towards me in these times of uncertainty. They showed great perseverance and tenacity while dealing with USCIS Officials. All of these attributes distinguish them as very talented and brilliant Attorneys. I am very thankful for all the dedication and support I experienced from the team at Manchanda Law Office PLLC. I highly recommend them to anyone dealing with immigration." "I would like to take the time out, to say thank you for the hard work that Manchanda Law Office PLLC has put into my case. Your professionalism and compassionate approach is very extraordinary. I had contacted many lawyers in Texas seeking legal immigration advice, but came up empty handed. When briefed on the matter, no one would take my case, some said "there is nothing that they can do," "I’m sorry, it’s hopeless," "you don’t have a case," and well, some just hung up the phone on me. I called the Manchanda Law Office PLLC on a Wednesday night at 8:30 PM and I was able to get legal advice immediately. When Manchanda Law Office PLLC took my case, they worked swift and aggressively, towards getting favorable results. Within approximately one week of hiring this law firm, my immigration problems were half way through. I would recommend Manchanda Law Office PLLC to anyone with immigration problems that require positive results, without hesitation...You are deeply appreciated." "There comes a time…We all find ourselves in the valley of despair sometimes. It seems that we are forever worrying, learning lessons, suffering pain, and facing challenges. But we must try to remember that the fertilizer that helps us "grow" is in those valleys, not on the mountain tops… My experience in dealing with the Manchanda Law Office PLLC has been nothing but tremendously rewarding. 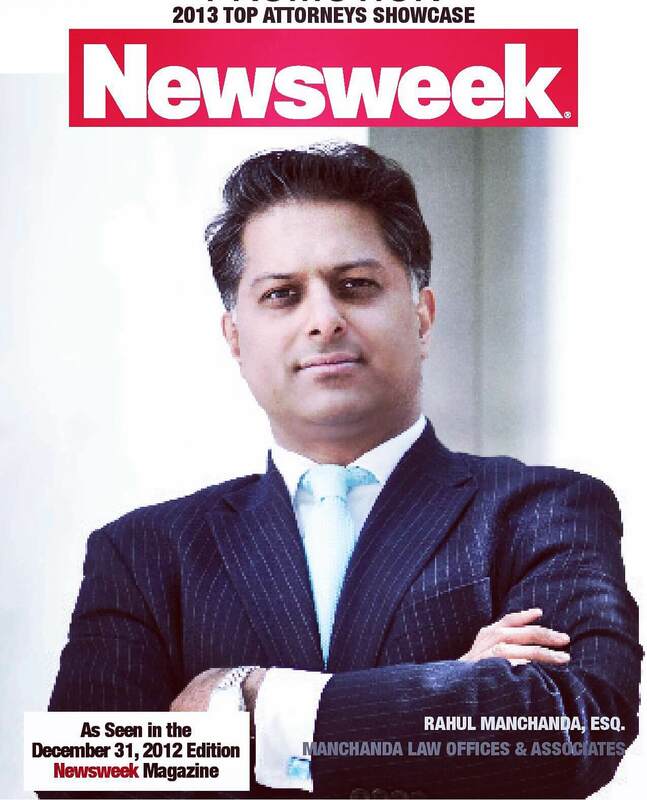 I came to Mr. Rahul Manchanda’s office and spoke with him in August 2007 about my husband’s case - an immigration case that was virtually mishandled by previous lawyers from start to end. With his dedicated, caring, and professional team, Mr. Manchanda and his group of lawyers were able to turn around this situation in such a way that I never thought would be successful for me, my husband and my son. I was on the verge of losing my husband over an immigration matter. This situation could have separated him from us for quite some time. This case turned around totally, moments before my husband could have been deported from the United States – a breakthrough that we never thought would have been possible in a matter of hours. The Attorneys at Manchanda Law Office PLLC were able to save my husband from being separated from us. There was never a time that I have tried to reach a member of this Staff and have not received a prompt response...Manchanda Law Office PLLC throughout my entire ordeal has been our vision of hope - handling our case from the very beginning by leaving no page unturned and has been exploring and proceeding with every form of relief that was available for him. Working tirelessly long hours, their consistent hard efforts, superb work ethics and strong motivation to be successful in this particular case has amazed me in every way. It is difficult to explain in words how hard Manchanda Law Office PLLC and the rest of the Staff have worked to reunite a family that was on the verge of being torn apart. I would therefore strongly recommend the Manchanda Law Office PLLC for any type of immigration matter...Thank you Manchanda Law Office PLLC and the rest of the Staff for all of your hard work on this case." "I just want to thank you and everyone who assisted in the preparation of the Letter to the Department of Homeland Security Legal Counsel to request a Motion to Reopen my case for adjustment of status to Lawful Permanent Residence. The diligence shown in researching the legal arguments applicable to this type of case was beyond my expectations, and was the reason why I chose your law firm in the first place. I am quite confident that the reasons cited will prevail in the Final Decision. I would certainly refer any friend or family member to your Law Firm in the future, to handle any complex immigration matter like this one." "I had a very difficult case. I was in Removal Proceedings after being married to a U.S. Citizen. Every lawyer that I would ask information from told me that my only option was to ask for Voluntary Departure, and forget about my marriage proceeding. Finally, my sister introduced me to the Manchanda Law Office PLLC, and it was the best thing that happened in my life. Manchanda Law Office PLLC got a Continuance of my case and then the Government dropped the case against me. Now I am just waiting for the interview to proceed with my legalization. THANK YOU VERY MUCH Manchanda Law Office PLLC!" "I just wanted to say that if only God can create more of you in this World, then the World would be a peaceful and a better place...truly God has done a fantastic job in bringing you into this World...God Bless You...Dear Mr. Manchanda...First of all I just wanted to say thank you to the best Attorney in the world for taking the time from your busy schedule to call me yourself to let me know the good news...thanks again... you are truly the best. Thanks again." "On behalf of myself and my family, we want to sincerely thank you all at the Manchanda Law Office PLLC for your services...And for that, we offer you our sincerest thanks. When and if the opportunity arises, we will recommend your services without hesitation. We appreciated your "can do attitude" and willingness to communicate. Keep up the hard work! You are a great team." "I appreciate very much your legal representation and thank you for representing my case personally." "All I can say is that (Manchanda Law Office PLLC's Attorney Work Product) exceeds my expectations and clearly is in my favor. Thank you." "Your Excellency Mr. Rahul Manchanda, I was so impressed by the way you handled my case. I am 100% satisfied by not only on the resolution but also on the process...I wish you all the best." "Mr. Rahul Manchanda, it has been a pleasure having you as my Attorney. My case had gotten into a very complicated situation. I had been trying to find a good Attorney for a long time. All the other Attorneys I spoke to advised me to go back to my home country, India, and avoid deportation or even a 10 year bar. I was all packed up, and ready to go back. Then, one lucky day, I found the Manchanda Law Office PLLC, when I searched looking for the best Immigration Attorney in the USA. I clearly remember how confident you were when you said that you will be getting my Green Card. It was such a big relief to hear those comforting and positive words. And for sure, within a year, I got my Green Card. You were a little expensive, but you surely got the job done. I thank you from the bottom of my heart, and will contact you in the future regarding immigration issues. Thank you very much." "It was a very good experience to have an Attorney-Client relationship with your esteemed law firm. Thanks and highest regards." "Mr Rahul Manchanda may have saved my husband's life. We are in Michigan fighting a losing battle caused by bad judges and Incompetent lawyers. When I contacted Mr Rahul Manchanda, I immediately felt like someone was listening to us. Mr Rahul Manchanda immediately took control of the situation and miraculously put together an amazing case in a matter of days. His aggressive quest for justice reassures me that all the wrongs will be corrected. Thank you Mr Rahul Manchanda for all your help!" "Attorney Rahul Manchanda is an excellent example of beyond exceptional service, reassuring with your case in his hand that you are in capable and efficient hands for a price that can't be beat. I recommend him wholeheartedly. When he took up my case, he boldly and confidently told me that my present situation would be rectified, and in a matter of days, like he had previously professed, it was rectified. His professionalism speaks volumes in that aspect when it comes to getting the job done." "After my brother was denied his Visa, I contacted several lawyers, I was frustrated when no one would do anything. Mr. Rahul Manchanda was the only one who decided to contact me and set up a meeting right away. He let me tell my brother's case and I did not feel rushed at all. Throughout the process he kept me informed and up to date and answered all of my questions on a timely fashion. As a result my brother was given his Visa and will be traveling to the US shortly. Thank you Mr. Rahul Manchanda for your hard work - I would recommend him to any one who is looking for a solution for their cases." "Thank you. Your Motion is Laser focused, well crafted, to the point and excellently written...I am truly impressed, and glad to work with such a hard hitting and truthful attorney...All the best." "Mr. Rahul Manchanda, I want to first and foremost say thank you for your kindness and generosity. I cannot express in words how grateful I am with your services thus far. You have shown and proven beyond shadows of doubt that you are indeed a great man of faith who is always ready and willing to stand by his or her clients no matter how complicated the situation. I am very much aware for your dedication, the tirelessness and tremendous efforts you have put in my case... and I intend to maintain a good relationship with you and your law firm even after my immigration case has been finalized and closed. I also owe you a debt of gratitude...I have seen for myself how great and awesome you are.
" Dear Mr. Manchanda: I would like to thank you Mr. Manchanda for the promptness and the effectiveness handling my case. After ten years away from my family we are finally reunited again. No other lawyer in Spain or the United States would take my case. The complexity of my case required a competent and experienced lawyer and you were the only one who could get results. You really made the impossible possible. In the future, for any other issue that I may face, I won't hesitate to call you. Thank you again, for this Christmas season, I will be enjoying it with my family. Sincerely,"
And, some of the peer-reviewed comments from actual fellow Immigration Attorneys, Lawyers, and Legal Practitioners from all around the United States, whom Mr. Manchanda has provided Continuing Legal Education ("CLE") for Federal Immigration Law, Criminal Defense, Deportation, and Removal Defense Litigation : User Feedback "Outstanding"
"This speaker was coherent and easy to follow. I was initially dreading the two hour session but the speaker made it easy." "Interesting and speaker was good and clear." "Wow, there is a lot of material, the guy doesn't miss abeat but you wuld havve to practice a long time to know the ins and outs but it was a godd course as almost all my clients are latino"
"Superb. Would be interested in further online CLE offered by Mr. Manchanda. " "Engaging speaker from a zealous advocate who still provided a balanced analysis. " "great speaker and good topic"
"Mr. Manchanda did a fantastic job! To carry the ball for 2 hours like that was remarkable. Must be a great advocate." "Interesting area of law presented compellingly." "good overview on immigration deportation and removal defenses"
"Rahul is a wonderful speaker and clearly a master of his practice area. " "This has been truly the best online course I have taken. Very informative and valuable information. " "Speaker really knows his way around in the Imigration, Deportation & Removal issues"
"Great introduction to the subject matter"
"he really knows his stuff"
"Good overview of the topic"
Federal Immigration Deportation and Removal Defense "Great speaker - passionate about the topic." "Appreciate the frank and professional manner in which superb presenter addresses issues arising out of web caused by incompetent counsel"
"I had no idea this topic was so dramatic and interesting. Thanks for using the real life examples. Really makes the topic hit home." "I really like the way the speaker was direct and unambiguous with the information. It made a lot of information easier to digest." "Complex but fascinating subject matter." "i truly enjoyed the lecture." "Very practical and easy to follow, which is an accomplishment in itself in immigration law!" "Really excellent. Good information for general practitioners and especially for criminal attorneys--both prosecutors and defense attorneys." "Very relevant for me - I could have used this information earlier this month!" "His eye contact with camera kept me feeling he was engaging me in the discussion." "Very informtive. A must for any criminal defense attorney"
"Very interesting. He was very articulate." "One of the best on Lawline." "Very practical information for today's world." "Rahul Manchanda is one of the best CLE instructors that I have encountered on LawLine.com"
"this is an area of the law which i am very interested in." "It was a great summary of this area of law - very helpful." "Very difficult subject for those not versed in it but well done"
"Compliments to Rahul as I believe he correctly used terms such as illegal alien and immigrant, which is absolutely necessary to understand what is going on. Thanks"
"Very thorough and knowledgeable. Great job!" "A thorough and clear treatment of a complicated subject." "Terriffic speaker!!! Great written materials and practical, hard hitting advice. Well done!!!" "Great program, lots of material. " "this was one of the best presentations. The presenter Rahul Manchanda had an excellent modulated speaking voice that was easy to follow, he offered good suggestions, clarified the points he was making. Overall, a thorough and well presented program. " "I liked that Mr. Manchanda gave real world examples and solutions to potential problems an attorney could face in immigration law." "This course coupled with the Padilla vs. Kentucky course is just outstanding!! These courses are a must for anyone practicing criminal defense. Thank you Lawline for having these courses." "Excellent speaker; with very well organized outline." "Most helpful presentation in putting forth strategies and applications of the law rather than an academic discussion of the topic." "I was surprised to find out the new tougher restrictions and I thought that Mr. Manchanda did a good job of getting across the need to do additional research and additional work when taking on Deportation and Removal cases under the new laws." "Good overview of a complex topic." "Terrific overview of a very difficult subject. " "Very informative and comprehensive overview of the subject by an experienced and knowledgeable practioner. Highly recommended." "Very good notes...good details that were easy to follow along with. " "speaker a master of his material and it showed in his presentation." "Good presenter with really good materials. " "Great Job! Good speaker and fervent advocate yet well balanced." "Excellent presentation. Very enlightening for a non-immigration practitioner such as myself. " "Immigration is a very difficult practice area and requires a good deal of expertise and experience to properly represent a client. This speaker did an excellant job in relating a very difficult area of practice to the novice attorney. Well done." "Excellent break down of a complex, and constantly evolving area of Immigration Law. Great!" "A few years ago, this seminar wasn't even a possible consideration to me to sit through. But since 911, and all the hub-bub about immagration reform, this seminar was quite revealing about the fight behind the lines to keep people within our borders who either deserve to be gone, or who have sympathetically gotten caught in our country's web of illegal and deportation immigration issues. " "very good organization of the information and a nice summary of a very complicated area -- I learned a great deal and will use the materials to help some clients currently in removal "
"One of the best speakers I have seen on Lawline." "Excellent overview of deportation issues and strategies. Superb presentation. Kudos to Mr. Manchanda." "Excellent presentation, substance and pace. A very interesting, informative CLE." "Great for criminal defense attorney's"
"Probably one of the best CLE I have experienced over the years. Attorney Machanda is knowledgeable, organized, well-spoken, convincing and capable of articulating a wealth of information in a short perido of time for an unsettled, problematic area of practice. " "very enlightening and a great presenter !" "Soon to be a critical subject." "Very good, but should run the written material on the screen next to the video." "Very informative, but should have had the written materials appear alongside the video." "True command of the subject matter. I learned a great deal!" "Never knew anything about immigration law prior to this-very timely"
"I appreciated his tactical tips." "Mr. Manchanda was well organized and presented the material in a way that kept 2 hours of CLE interesting. " "Very informative and useful. My practice is mostly criminal and the implications on clients who are not us citizens are many times far more severe than the underlying criminal charges. Great seminar good presentation." "Excellent lecturer. Great materials- I enjoyed learning about Coram Nobis which I think may be of use to help people overcome the negative employmen teffects of decades-old convictions. Thanks." "I thought this presenter was one of the best that lawline has provided. Material was succinct, interesting and informative." "The presenter did an excellent job." "Probably the best speaker so far." "Well paced, very effective teaching style"
"Good treatment of this area of law especially as it relates to criminal law convictions." "well presented and very informative. worth downloading to mp3"
"Expert presentation of a complex topic." "great for atty. with general practice"
"Very thorough presentation; it helps to have a criminal law background to understand the points; speaker really addressed the practice considerations for legal aid attornies "
"very impressed with the quality of the teaching." "Excellent with many practice tips and details." "Very timely and interesting infornmation. A good general overview." "wonderful and clear presentation on a very interesting subject!!" "Mr Manchanda's delivery style is engaging and effective. " "The presenter had a nice style. Content was well organized and had a logical flow to it. Did not seem scripted." "Interesting material since I do not work in this area." "This is a great seminar. How often, and where does he give other seminars?" "This course is highly rated, and it did not disappoint. I've already got several useful strategies to use with current clients. " "Very relevant to the current issues of immigration." "excellent primer - interesting too"
"An excellent course to help the attorney line up their thoughts about how to handle any potential deportation and removal case. Clear, concise, easy to listen to." "great job with alot areas to discuss"
"outstanding review of subject matter"
"Deftly handled presentation of a complex subject area by someone who has mastered the material. Excellent presentation style." "This subject was difficult. However the speaker did a good job of going over it in an orderly fashion. This is a good subject for Florida lawyers especially to be familiar with." "presenter was really high energy and clear. I really learned a lot from this session. very informative and practical." "VERY IMFORMATIVE. VERY INTERESTING. VERY KNOWLEDGEABLE." "very detailed,informative,knowledgeable, and well presented." "Very interesting topic presented by an obviously well qualified speaker. " "Dear Sir - I am delighted to read your good mail, the correspondence between you and the U.S. Consul, I am proud of you, I pray God give you good health. You have performed beyond my expectation and I cannot quantify your good service...you have succeeded in proving to them of my status...I have known you for good and I pray that I may be useful to you for good purpose in future. Thanks so much Sir." "Rahul Manchanda is the attorney you want on your team if you can't afford to take any chances with your legal representation. I approached Mr. Manchanda at a very bad time when an unfortunate criminal case was brought on against me, one which could potentially threaten my employment as well as my sensitive immigration status. His first order of business was to get his facts on the matter after which he went on to assure me that he will resolve the matter for me leaving no stone unturned. He is the only lawyer I could believe as his manner was not only highly competent but also very reassuring, compassionate and humane, a very rare mix in his area of business but trust me is just what one needs in a desperate situation. He immediately went on to systematically work on my case and in the next few hours worked feverishly to put the right documentation in place getting every last piece of information together. Even in that highly anxious state, I was able to see that I had made the right choice with an attorney who leaves nothing to chance, is proactive (he did not leave anything for the next day) and is very aggressive in protecting his client's every interest. In less than 15 days Mr. Manchanda got me an offer of dismissal of the case and averted a potential catastrophe for me. I am forever thankful and grateful that I retained Mr. Manchanda at the right time and strongly recommend his services for any civil, criminal or immigration related need because his expertise, experience and ability in getting the job done are truly exceptional!" "Mr Manchanda: Good morning to you. I just reviewed your letter. Thank you for sharing it with me. Your continued support and help in my sisters case is greatly appreciated. Light and Blessings." "Mr. Manchanda is a saving grace. He is an exceptional legal counsel who is prompt with every response. Stating that he is well versed with immigration and employment law, is an understatement. He was aggressive and focused on resolving my case from our first interaction. I am truly glad to have found Mr. Manchanda to represent me." "I had used Mr Rahul Manchanda for my case. It was a pleasure working with him. I got the very quick response for all of the questions I had asked, and my case was filed as soon as I sent in the documents. I would definitely recommend Mr Rahul Manchanda. I Thank Mr Rahul and his team for the cooperation." "I would like to highly recommend Rahul Manchanda of Manchanda Law Office PLLC, who has done a great job in getting me the visa I needed and keeping me calm in this process (although I was nervous). Rahul Manchanda is super professional and knows what he is doing. He delivered on his promises and has shown himself to be trustworthy, dependable and highly knowledgeable. I will keep on working with Rahul Manchanda and will recommend him to others." - Micha C. (New Jersey and Israel). "Thanks again for being the only one to help with this! Rahul Manchanda is worth every penny!!! I was involved in a very challenging, long fought child support case and Rahul was the only Attorney willing to get his hands dirty to help. Thank you Rahul for never giving up and pushing me to the limit to get this done. Took some time but you made it happen just as you stated in our initial consultation! I recommend Mr. Manchanda to anyone and everyone seeking legal advice. Awesome job!" "Mr. Rahul Dev Manchanda - First of all, thank you for taking my case. With his remarkable knowledge, Mr Manchanda made positive changes in my life, he put things together where I didn’t even have hope. I appreciate the time beforehand listening. The experience I have had with Mr Manchanda's office exceeded all my expectations. Thank you for helping individuals like me with immigration issues achieve their goals. It was a pleasure working with you. Your knowledge and patience is the key for my success today. Thank you for solving my problem in such a short time. Thank you very much, once again." "Rahul Manchanda - a miracle maker and a true professional - I met Rahul a few months ago while changing my visa status. One of the biggest things I needed his help with was getting through the green card process. I heard a lot of stories on how it is long and hard, etc. Rahul Manchanda was very professional, and focused exactly on what was needed to be done, and got the process rolling very fast. He is a real miracle maker on the immigration front. If you're only considering using him - don’t consider - use his services - signed, a very happy customer." "-Prompt response to emails/calls. -Excellent ideas/approaches to resolve the problems with the case. -Determined in helping the clients than simply representing. -Will go lengths taking your case to civil rights group attorneys and DHS higher-ups to make your case be heard and noticed by USCIS. Highly Recommend for any immigration case." "I would like to say thank you to Manchanda Law. Before working with Mr. Manchanda I was very discouraged, and the possibility of losing my family seemed more real. Mr. Manchanda provided me with hope. He is the best attorney anyone could ever have! He took my case, although it was a very complicated case. He is very professional and well knowledgeable. He explained everything about my situation in details and made sure I understood it. He is very diligent in his work, and he cares about his clients. I highly recommend his services." For my U Visa case, many people referred me to several lawyers but i found most of them lacking my expectation in some way or the other. After looking for sometime, one day i decided to go with the best lawyer for my case as i din't want to take half chances. On Google, i found him to be the best rated lawyer. i contacted his office and was able to talk to him and explain briefly about my case over the phone. At my first meeting with Mr. Rahul Manchanda at his office, the way in which he heard my case in detail & after seeing his prompt, meticulous & aggressive approach, i was fully convinced that he was the best choice i've made. The energy & speed at which he worked on my case was impeccable. He was very professional in his approach & responded very promptly to each one of my case-related queries & doubts. His vast experience as an immigration lawyer, energetic approach & a never give up attitude is few of his many attributes which makes him stand apart from all other lawyers in the United States. I shall never forget his immense contribution in resolving my U Visa case. Thanks a lot for taking up my case. Wish you all the best !!! GOD BLESS YOU !! Let me know once it is done. Thank you.